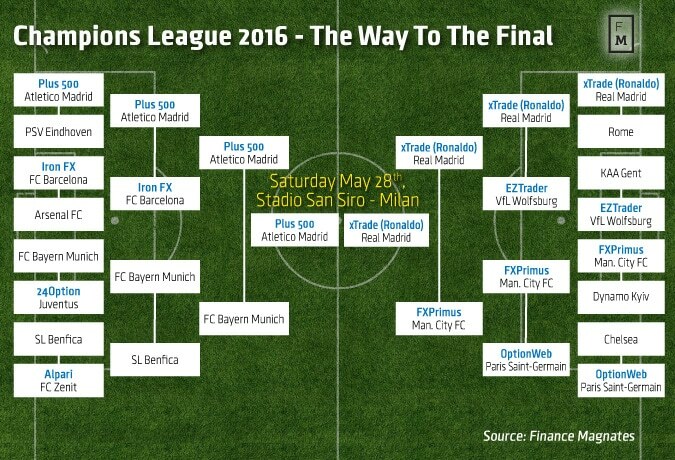 Betting on Gold: Which Forex Broker Will Win the Champions League Final? Plus500 sponsored Atletico Madrid will face off with XTrade’s ambassador Cristiano Ronaldo. For football fans the fast approaching weekend is going to be a big show. After months of group phase games, quarterfinals and semifinals, the Champions League is coming to its conclusion with the final game between Atletico Madrid and Real Madrid. What is the relevance of this event to the industry you might ask? A duo of foreign exchange brokers may have a say here. Atletico Madrid has been sponsored by Plus500, while Real Madrid’s top striker Cristiano Ronaldo is the ambassador of XTrade. Both brokerages are going to face off in a way, with the current odds being evenly divided. Real Madrid hasn’t won a game in the Spanish championship against Atletico Madrid since April 2013. In the last five games, Atléti has won three, with the remaining two ending in draws. That said, Real won the Champions League final in 2014, which gives Atlético a chance for revenge. The face-off between the Spanish giants will this year be a symbolic competition between Plus500 and XTrade, albeit Plus500 the clear leader in terms of branding with the broker’s logo being on display on the jerseys of the players of Atletico Madrid. The game will be played on the Giuseppe Meazza stadium in Milan. “What we know already about the result is it’s certain to be a Spanish winner from the City of Madrid, what we don’t know is which of two great clubs will win. Atléti has an even better team than the last time they played Real in the final and arguably are the best team in the tournament – given they beat reigning champions Barcelona on their way to the final,” he elaborated. Not being a publicly listed company means that XTrade doesn’t have the same resources as the London listed broker has, but the firm is still an active participant in the face off via its brand ambassador Cristiano Ronaldo. “Cristiano has had a phenomenal season, scoring over 50 goals in all competitions for the sixth year in-a-row. We’re confident he can claim more silverware in Milan. We hope Cristiano can create another iconic moment again against Atletico,” he added. Is There Value in Football Sponsorships? Forex and binary options brokers have been active in sponsoring football teams in Europe. Across the top 5 leagues – the UK Premier League, Spanish La Liga, the German Bundesliga, Italian Serie A, and French Ligue 1 – there are 23 forex and binary options club partnerships. Amongst the top 5 leagues, the UK Premier League comes out on top with a total of 8 companies active with sponsorship deals. Looking in detail we see 3 teams in the Bundesliga, 3 in La Liga, 4 in Ligue 1 and 4 in Italian Serie A. The most lucrative league to advertise in is the UK Premier League due to the global reach and the way TV broadcasting rights are sold and consumed globally. Recently forex and binary options brokerages have been actively increasing their engagement in this sector with hopes that their brand could stand out and grow big. That said, the results from the sponsorship deals cannot be quantified yet and are largely depending on the specific ways in which the sponsorships are used. To put things into perspective, a team like Manchester United has about 659 million followers on social media globally. Amongst those, 50 per cent come from Asia, 26 per cent from the Middle East and Africa. With the website of the Red Devils getting 60 million page views per calendar month, 5 million unique visitors per calendar month, with 69 per cent of those coming from outside of the UK, the attractiveness of sponsoring a global leader makes some sense. The big question is how much money can a broker commit to such an advertising endeavor without overextending. To recap the current state of play, Finance Magnates spoke to one of the brokers of deals in the football sponsorship arena, CEO and founder of SportQuake, Matt House. “FX and binary brands are using sport as a fast track to achieve rapid multi-market brand awareness and credibility. Over 30 brokers are currently investing in sports sponsorship and football in particular has attracted the most partnerships. Over two thirds of these kind of sponsorships are in football, with the Premier League accounting for 28% within the sport,” he explained. “As Barclays’ title sponsorship comes to an end this month, exclusivity in the financial sector opens up and for the first time FX brands will be able to buy Official Partner marketing rights packages and appear on LED without having to commit at shirt or stadium level as was the case previously. 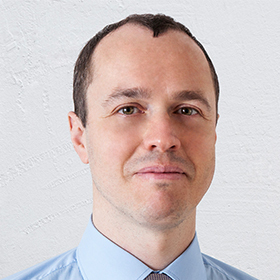 This development is driving significant demand from our clients in the FX and Binary sector,” he explained. With the gambling crowd that football fans are, the brokers are not only aiming at prospective clients, but at those that are close to taking big risks. This can be a double edged sword for the forex and binary options industry. If football fans end up with yet another way to lose money by betting recklessly, sooner or later regulators will have to step into this game. Recently, French authorities have already flagged that some brokers from the industry are attracting clients via football sponsorships. Brokers have to be committing enough resources to education in order to be able to attract a sustainable client base that can be retained and grow in the long run. Unfortunately, at present, very few companies are dedicating adequate resources for proper education of their clients. Instead they are focusing on attracting the gambling type who loses his deposit quickly and loses interest even quicker. While football teams have been doing this for a relatively short period of time, their brands have not suffered from too many fans losing their money with brokers that have been effectively endorsed via a sponsorship deal. If too many clients that are loyal fans of the clubs start complaining about the ways in which they lost their funds, the interest of the teams for co-branding will quickly evaporate regardless of the financial rewards.